The scrapbook store, Recollections, recently closed in Columbia, Md. I went to the 90% off sale and found these paper mache letters. They were 10 for a buck and the selection was pretty limited. No vowels to be found so the idea of spelling the boys names was out. So instead I painted all the letter to match the colors in their room and then hand painted a small picture of something that represents each letter. 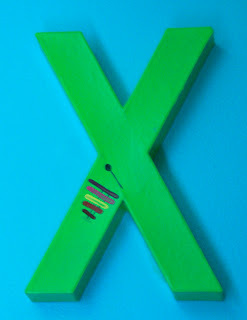 B is for Butterflies, X is for Xylophone etc... 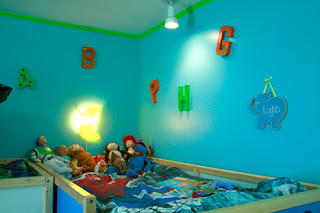 I attached the letters to the walls using liquid nails. They may be up there forever, who knows. My alphabet obsessed sons are loving it. Logan's response when he saw what I did while he was at school : "This is SO COOL!!!!" I hope I'm that cool when he's a teenager.